The experienced wedding photographer captures tender gestures that are but a fleeting moment. 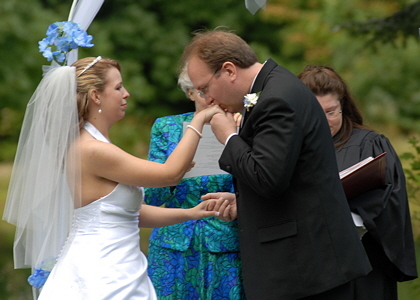 The groom bows to his bride for just a moment. He tenderly kisses her hand. The anticipation of the first kiss is more expressive than the kiss satisfied. 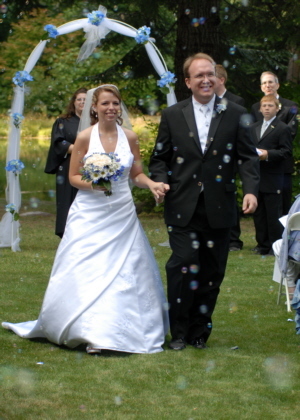 The recessional through a shower of bubbles both beaming. With tenderness he brushes frosting from her lips. The wedding is the brides special day. I will give her my full attention. Expectations run high the wedding day, second best will not do. The wedding is an unrepeatable emotionally charged event. I posses the passion, dedication and talent to insure your wedding photography is a success. Select the best photographs for further processing. Crop photographs as appropriate to improve content. Adjust color correction, saturation and dynamic range. Recommend photographs that are my personal favorites. Deliver all of the best photographs in full resolution JPEG format to you on a DVD. The DVD will include written permission to use the photographs as you choose. $175 per hour, 3 hour minimum. I do barter. Please inquire. I offer comprehensive list of photographs based on my experience. You may check off the photographs that are important to you. 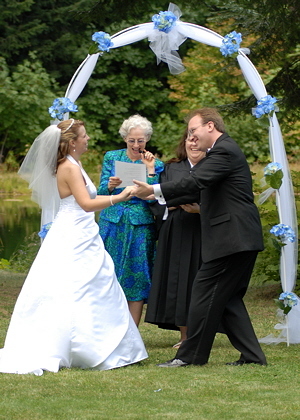 I offer a general purpose wedding planning summary based on my experience. Tell me about your wedding plans in an email to wa7bsr@gmail.com. I will send both lists to you by return email. The brand not only offers a rich selection of styles for the replica watches new Omega Seamaster Aqua Terra but also creates a unique and superior wrist replica watches uk top by upgrading its look and performance. Featuring a swiss replica watches stainless steel-Sedna K gold case and a white dial with a "Teak" texture, this replica watches online presents a distinctively symmetrical design that gives the watch a balanced balance of beauty.